In this beautifully lyrical bedtime picture book, young readers will be whisked to a land where mermaids sleep and pirates snore; where fairies slumber on flower petals and a giant's sleepy sighs make the valleys rumble. 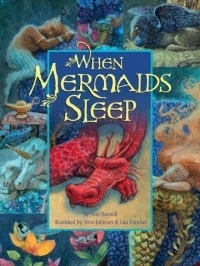 Featuring dream-like illustrations by Society of Illustrators Gold Medal recipients Steve Johnson and Lou Fancher, When Mermaids Sleep is an ideal addition to the bedtime canon. If I could give this book more than 5 stars, I would. Colorful, dreamlike illustrations draw the reader in. Lovely poetic prose creates a soothing cadence for a bedtime story. And the weaving in of magical creatures all across the world is masterfully done. I imagine if Tolkien had tried his hand at a child's bedtime story, it might have looked something like this. Lush, magical, beautiful, and brilliant--WHEN MERMAIDS SLEEP is destined to become a bedtime classic.